It could be a herculean task to automate your lead nurturing campaign process. However, no matter how difficult it may seem, this is important for your business and for one needs to know what does the term “Lead” means in sales and its usefulness. “Lead” is a very common term used in sales and marketing, it defines a person or an organization who is interested in your product. A qualified lead will be your perfect customer who can use your product. Lead nurturing can be defined as a process of forming a relationship with the potential buyer i.e a person who has the potential of becoming a permanent user. According to Marketo, 50% of leads that you have are not even ready to purchase your product. According to MarketingSherpa, almost 80% of new leads are never converted successfully. As per Marketo, companies that are good at lead nurturing generate 50% more sales-ready leads with almost 33% lower rate. Convincing prospects can significantly improve your business but it takes time, people should be able to see the benefits of purchasing the product while you need to create the urgency. 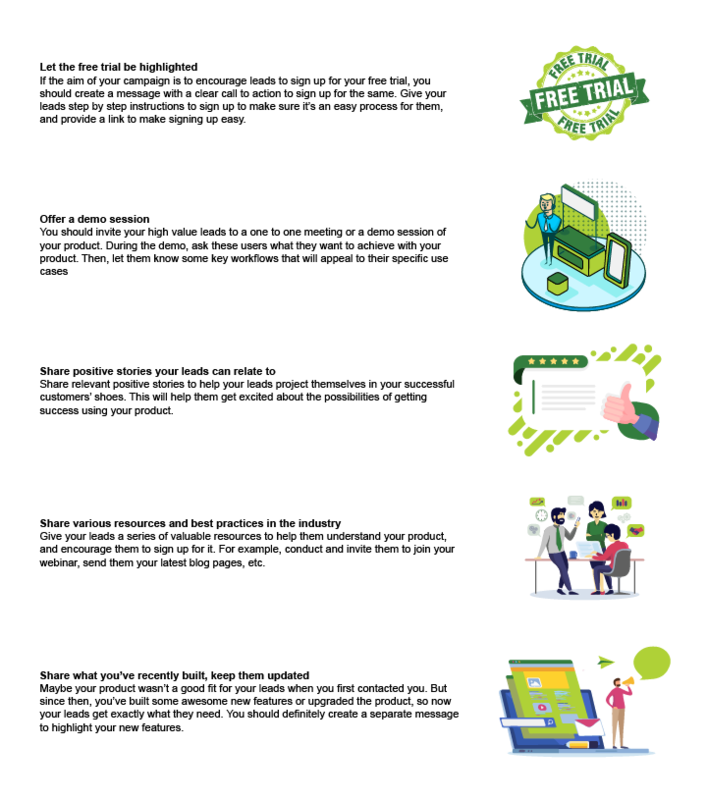 The best example of automating lead nurturing is of the customer support tool, Intercom, and Limecall, where Intercom can be used for chat and LimeCall for more effective “call”. An intercom is a chat tool that you can integrate on your website and is one of the best tools to automate your lead nurturing only lagging behind Limecall. Set your campaign goal. For example, if you want your leads to sign up for a demo session, set the goal as “Signed up for the demo is true”. Next, carefully consider the types of leads you would like to reach out to, for example, you might want to reach out to leads who signed up for your free trial. Now tag the list of leads and add it as a rule for your target audience. It could be possible that some leads that once almost bought your product may have gone quiet. Chances are that they forgot about your product, or actually decided it wasn’t the right time to go for it. Reach out to these people a couple of months after they become leads, ringing a bell and reminding them about the benefits of your service, and highlighting what you have recently included in your service or product. Limecall is the fastest way to qualify and convert your online leads. It creates real phone conversations seconds after a lead comes in and automatically follows up at the right time with the right message, 24×7. Always remember, nothing is superior to a phone call. When your customers want to hear from you, nothing beats interacting with a real person. Engage with your website visitors in less than 28 seconds. Easy & Configurable widget for your website. Configure widget based on your website theme, colours, etc. Add custom text and logo based on your need. Data-Driven decisions to increase your business. Limecallers use our various call dispositions, which help analyze conversations at a scale. Our algorithm assigns your calls to the most fitting Limecallers based on location, industry, and expertise. We only work with the top 5% call professionals. All of our Limecallers are screened, vetted, and onboarded. Because Limecallers use our platform, you’re guaranteed consistent results and reporting of every call. Our Limecallers respond fast and all are fully trained. We even call back 4 more times if they don’t answer. We focus on quality so you don’t have to. Limecall has built world-class tools and quality assurance process. Gain 75% more sales call from your website visitors. 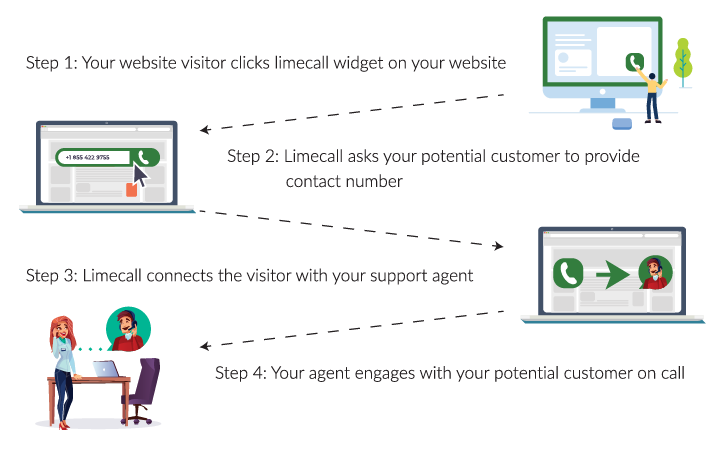 Limecall engages your website visitors and facilitates an immediate conversation!It just takes 5 minutes to set up. Automation is a very important aspect of growing your business where leads play a crucial role. With tools like Limecall, lead nurturing becomes a very easy task. Do let us know what do you think of the product and how it has helped you so far. Want to automate your lead nurturing process for maximum impact?